Enjoying a dram with some chocolate this Easter? Before you celebrate the long weekend, know that picking a phenomenal whisky and pairing it with a thin, supermarket Easter egg is an exercise in self-defeat. Matt Evans hunts for top-quality confectionery to pair with the whiskies in your cabinet. Chocolate and whisky, unsurprisingly, go together extremely well. The warming, complex nature of most whiskies complements and undercuts the luxurious, creamy texture of good chocolate. However, matching the two, like any dish, requires careful thought. Enter the experts. 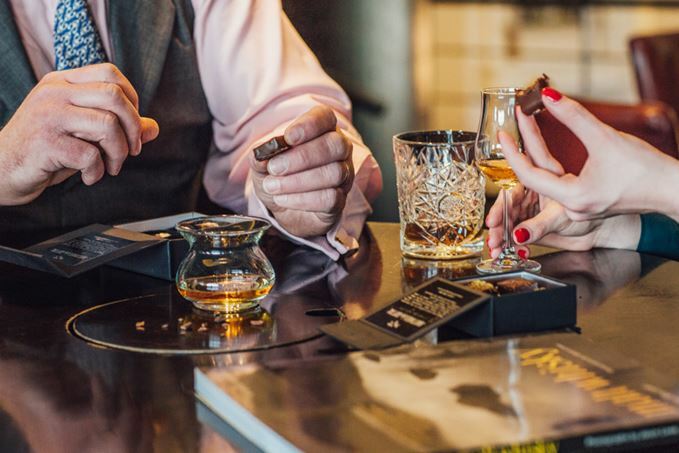 Paul Maden and James Findlay, artisan chocolatiers and the brains behind Highland chocolate company Cocoa Mountain, are on hand to match 10 different, common whisky flavours to individual chocolates for an experience like no other. It’s going to be a very happy Easter. Medicinal notes in whisky, like the legendarily polarising Laphroaig, will settle well with a mint chocolate. A perfect after-dinner palate cleanser, the peppermint combination will be an uplifting one, promise Maden and Findlay, turning the powerful Laphroaig 10 Year Old into a rejuvenating, restorative dram. Subtler whiskies that smack of orchard fruits should be paired with nuts – ideally toasted almonds – and raisins. ‘All of these ingredients complement each other: raisin with apple, pear with almond,’ says Maden. The lingering flavours are likened to the famous ‘everlasting gobstopper’ from Willy Wonka – if you can resist wolfing it all down in one go, that is. Dark chocolate with ginger makes for an intense flavour on its own, meaning a lighter whisky will be lost to the punch of the chocolate. A robust dram like Balvenie Doublewood 12 Year Old, however, is going to match and balance the high cocoa content and strong ginger taste. Old sea dogs that whiff of salt and spray work well with great-quality milk chocolate. Maden and Findlay recommend milk chocolate with caramel tones that will pair perfectly with distinctive tastes like Old Pulteney. Between the whisky and the chocolate, the pair make up salted caramel – a match made in heaven. For heavier, burned caramel-flavoured chocolate, consider a peated whisky. According to Maden and Findlay, ‘smoky, burned, sugar-creamy milk chocolate’, more intense than something you’d pair with a maritime whisky, is the choc you should match to Ardbeg or Lagavulin. The end result? Relaxing by an open fire, regardless of whether you’re anywhere near a place with a working chimney. Chilli and chocolate is a popular flavour combo, and pairing a delicate chilli chocolate with lighter, sweeter whiskies like Auchentoshan brings unexpected flavours to the fore. The Cocoa Mountain team recommends a white chocolate truffle with chilli and lemongrass for a subtle, gentle and thoroughly warming experience. Maple and pecan is a classic flavour combination that can be found in most high-end chocolate boxes. Should you come across one, save it for a caramel, citrus-bouquet sipping whisky like Glenmorangie. The end result feels like maple syrup on fluffy American pancakes, enhancing a whisky that won’t break the bank. Creamy Sherry and rich Christmas cake flavours could battle it out with more intense chocolates, but lose the subtleties of both. The Cocoa Mountain team recommends a high-quality white chocolate as a perfect pairing here. ‘The white chocolate is quite unusual as it’s not too sweet, and will complement, not overwhelm, the whisky notes,’ says the team. With strongly-flavoured whiskies, the chocolate’s there to enhance, rather than compete. ‘Wild card here, looking at this from a chocolate lover’s perspective,’ says Maden, ‘but try a measure of this in a steaming hot mug of our Best Hot Chocolate.’ Forgo the cheap instant powder to keep things luxurious with a tin of artisan cocoa mix. If you’re feeling really brave, make it yourself by melting the highest-quantity cocoa chocolate you can find into hot milk and sweeten to taste, before adding a nip of the good stuff. Happy Easter!